This beautiful 50 gram Gold Bar PAMP Suisse Lady Fortuna is part of PAMP Suisse’s most popular bullion series - the Lady Fortuna gold bars. Struck from 50 grams of 99.99% pure gold, this incredible bar showcases the renowned Roman Goddess of luck and fortune on its obverse side - Lady Fortuna - the symbol of prosperity and welfare. 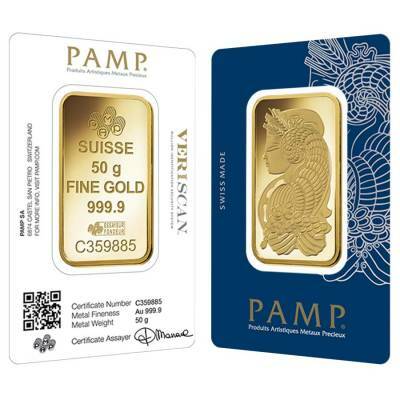 PAMP Suisse, the premier bullion brand was founded in 1977, in Ticino, Switzerland. This state-of-the-art mint became worldwide renowned due to its high-quality precious metal products. The prominent refinery is also recognized as the first company to introduce innovative security measures against bullion counterfeiting. 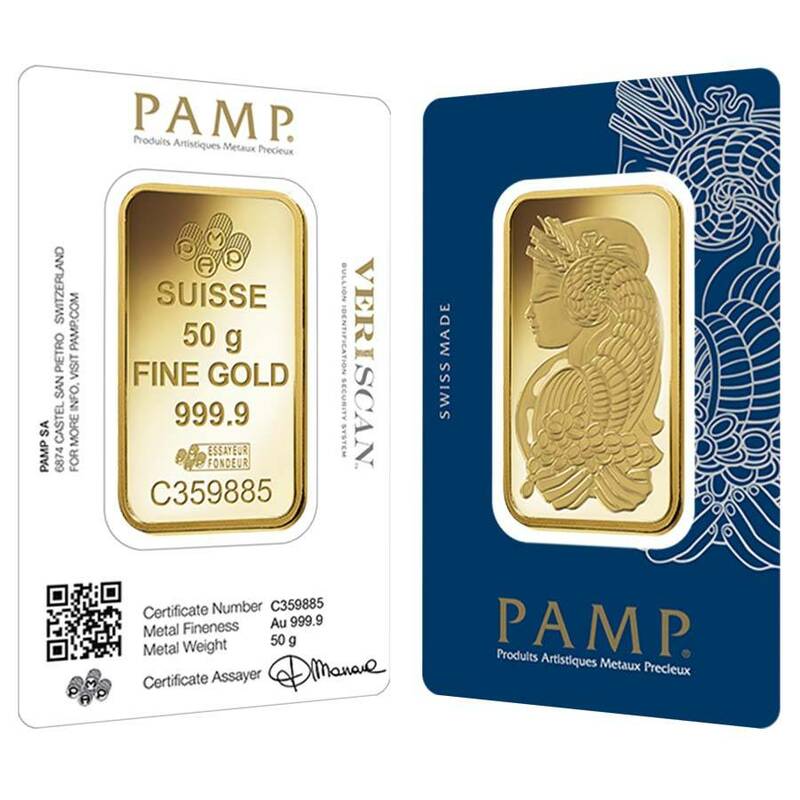 The most beloved gold bullion series of PAMP Suisse, the Lady Fortuna gold bars, also incorporates the latest Veriscan® secure technology. Each bar has its own microscopic surface topography, the so-called digital fingerprint, used for registering and authenticating the bar, making it a secure investment. The Lady Fortuna series depicts the famous Lady Fortuna obverse design - the image of the Roman Goddess of luck and chance. Also known as ‘Lady Luck’, she is represented like justice, wearing a blindfold, holding and sharing her rich cornucopia with others. 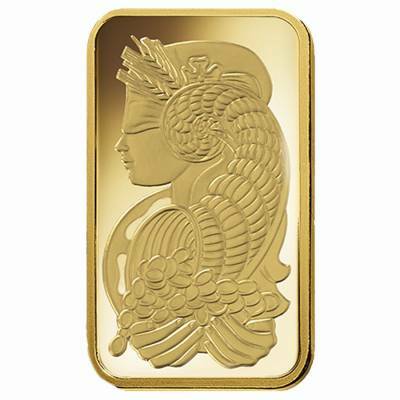 This impressive 50 gram Gold Bar PAMP Suisse Lady Fortuna is the symbol of prosperity and an excellent gift and investment opportunity. Made from 0.9999 fine gold with a weight of 50 grams. 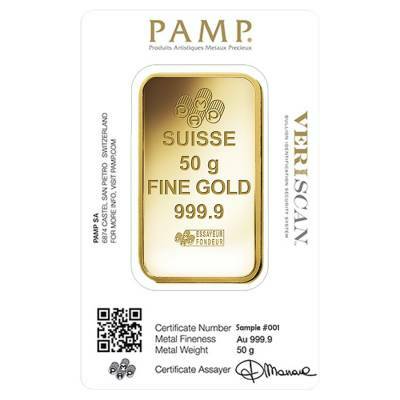 Precious Metals IRA-Eligible and backed by PAMP Suisse. 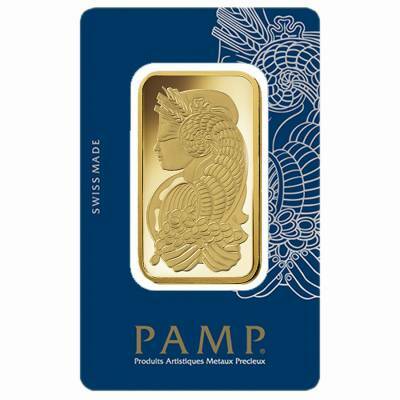 Provided by PAMP Suisse in the original assay card. The bar incorporates the exclusive Veriscan® bullion security technology - The latest PAMP Suisse security feature which is a microscopic surface topography displayed on each bar. This is perceived as a uniquely assigned digital fingerprint used to register the bar in PAMP’s catalog and authenticate it when it’s scanned. Obverse: Represents the beautiful image of Lady Fortuna - the Goddess of fortune and chance, being also the protector of grain supplies according to Roman beliefs. She is depicted with a blindfold on her eyes, the symbol of life’s unpredictability while she is generously sharing her rich cornucopia with others. Reverse: Features the PAMP Suisse logo. Also engraved are the purity and weight, along with the words “Essayeur Fondeur” and the unique serial number, both certifying the bar’s authenticity. 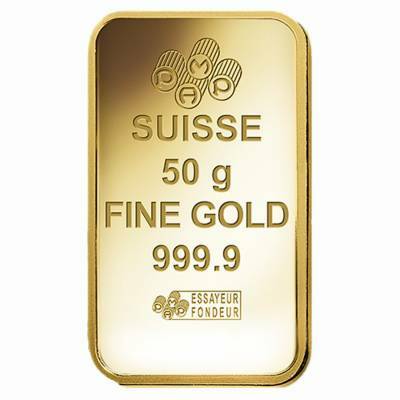 Looking for the best place to buy high-quality gold bars - you’ve found it! At Bullion Exchanges, we are proud to offer you 100% authentic gold bullion bars. 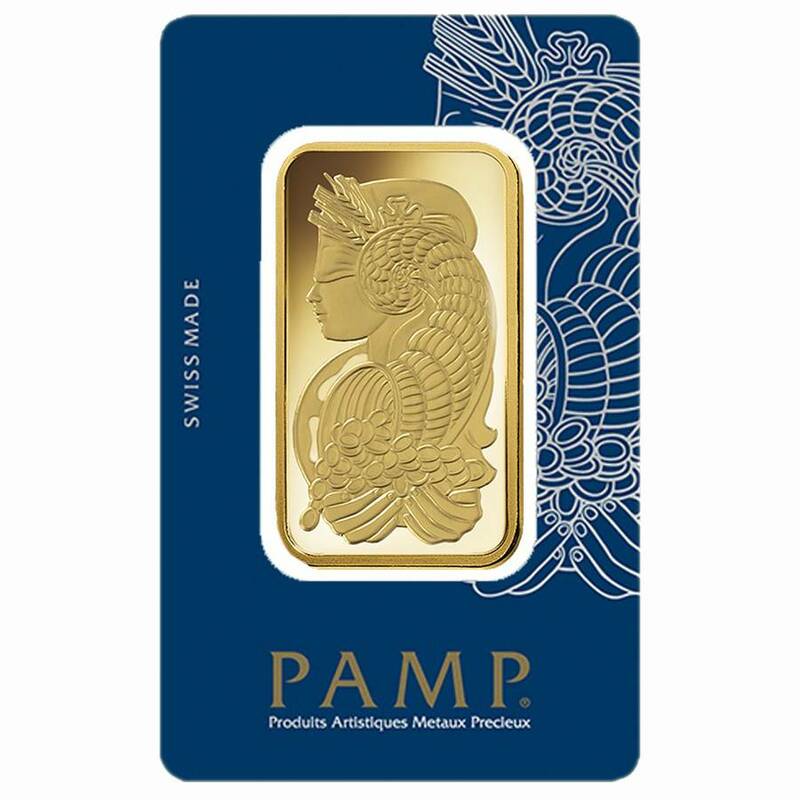 Choose this 50 gram Gold Bar PAMP Suisse Lady Fortuna and add it to your remarkable investment portfolio - just click on ‘Add to cart’. We will get your bar wrapped and packaged for a safe delivery! For any questions, you can contact us at 800.852.6884 or message us, and we will happily assist you. With this purchase, you earn 2108 Bullionaire Bucks 2108 BB = $2.11. We currently have 901 of this item in stock. For every $1 spend, you will earn 1 Bullionaire Buck which is equivalent to $0.001 off a future purchase. 2108 BB = $2.11.